First off, a quick biology lesson. We have receptors throughout the cells of our body including our brains. Receptors are like locks that only specific keys can open and cause effects in the cell. We have natural opiates produced by our bodies (e.g. endorphin) . An opiate agonist is a chemical that binds with the opiate receptor and causes effects like analgesia ( decrease in pain sensitivity), feelings of euphoria and can create tolerance and addiction. It is triggered when an opiate molecule, of a specific size and shape, fits like a key into that receptor’s lock. However, there are some molecules that fit into the receptor but don’t activate it. Opioid antagonists block opioid receptors from activation. As Dr. Barnard’s essay suggests, opioids might regulate preferences for foods high in fat and sugar not because these foods contain opioids but because eating them releases natural opioids (Drewnowski et al 1992). 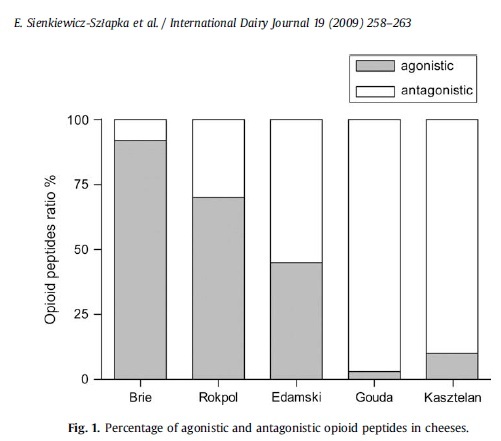 I would conclude that if these agonistic casomorphins are really important for causing an addiction to cheese we would see a big difference in the popularity of cheeses depending on the ratio of agonistic to antagonistic casomorphins. Unfortunately the authors of this study did not test cheddar – one of the most popular cheeses in the world – but if it’s anything like the other semi-hard cheeses in the study we would expect it to have a greater percentage of opioid antagonists. The next problem with the idea of cheese addiction is the question of whether or not the opioid peptides (protein fragments) could pass through the gut into the bloodstream and the brain. There is evidence that these peptides pass through the guts of infants (casomorphins are also found in human breastmilk) and through their immature blood-brain barrier (which keeps lots of stuff out of the brain that circulates through the blood) but has there been any evidence that they cause morphinelike effects? There has been a case study linking cow’s milk consumption and sleep apnea but in a larger study of infants who were breast or formula fed they found no difference in average psychomotor development between the two groups. Another study found markers of human beta casomorphin 8 in the brainstems of human infants. (To correct something I said in the show, these casomorphins are from human breast milk and not dairy). This leads me to think that it is improbable that dairy has addictive properties in adult humans. There is evidence that casomorphins pass through the gut of adults but, as far as I could find, no evidence that dairy has opiatelike effects on adult humans. The only thing that came close was this study showing a lowering of blood pressure in those who consumed “sour” milk as opposed to regular milk – however the difference between those milks was not attributed to casomorphins but to other peptides. One main effect that opiates like morphine have is analgesia (decreased sensitivity to pain). If dairy has enough opiate peptides to create addiction one would expect that dairy would also decrease pain sensitivity. However, I was unable to find any studies relating dairy consumption and pain sensitivity and during my postdoctoral research at the University of North Carolina working with pain data I never saw any questions about dairy in the protocol. This blog has been pretty far afield from my scientific speciality and I’m grateful for any criticism of my methods or conclusions. But three main pieces of evidence suggest to me that Dr Barnard is in error about the possible addictive properties of dairy. Love the Devil’s Advocate role that you played here…thanks for sharing the research. It’s easy to understand why everyone gets so confused about what ‘healthy’ is. Thanks! I’m not sure I played “Devil’s advocate” since I really believed the position of Dr. Barnard until I read the data and then changed my mind. Leaving the data to one side I’m not sure if the idea that dairy is addictive is productive in helping people to quit. Perhaps it makes people approach quitting with greater willpower or, on the other hand, gives them an excuse when they backslide. Sorry, but I find Dr. Barnard much more credible. Then too he has the credentials as well. In any case why would anyone want to use cow’s milk in any form? Yecch. This blog doesn’t endorse eating cheese or drinking cow’s milk. Furthermore, I don’t think the claim that cheese is addictive is a great tool in the arsenal of advocating against dairy. As for credentials, that’s the great thing about the scientific literature. Anyone can read articles and form their own informed opinion about scientific claims with evidence. It’s evidence and reasoning, not having letters after your name, which should make claims compelling. Seriously, you dont need letters after your name!! People should be more self-confident. I too used to believe Barnard. But I do have the feeling he’s ready to say a lot of things to promote the vegan way. I’m a vegan. But I know that there are people and organizations out there, PETA being one, that will “lie” to promote their agenda. Recently I’ve had the feeling that Dr. Barnard, who by the way is on the board of PETA, might be using the same technique. What matters for these people is that the animals are saved. That matters to me too and the reason I became vegan was first because I think eating meat is not ethical. Health concerns came second. Whatever your agenda, I don’t think it’s worth it, on the long term, to omit telling the truth ( I guess that’s an euphemism for lying?). Why not simply tell people that cheese is an unnatural food because of its saturated fat content ( up to 70% for some cheese) and that it’s pure poison. That should be enough. No need to talk about addiction. I too haven’t found any scientific evidence or mention about the fact that cheese could be addictive. News-break: Chronic pain suffers mob supermarket for cheese. News-break: New study to test how strong morphine is in cheese. The test subjects will eat a diet of only cheese for a whole month. After which they will be subjected to series of intensive pain tests. News-break: Drug addicts break into cheddar factory and make off with a large quantity of cheese. I wonder why drug addicts haven’t caught on. They could buy up a whole lot of cheese (it’s real cheap) and start reducing down to extract the morphine. Wow they could make a fortune $$$$$$. There’s a lot of money to be made here. Listen up all you drug addicts. All offshoots are a cult including your website. That entire article is his sermon. Paul has left that cult group and has declared that “it was all a big scam”. As for ideas that morphine from cheese has a morphinelike drug affect on the body. I was would like to know if those so confidently preaching these ideas eat any grain products or soya products because these products contain gluteomorphins and soymorphins.